The Daring Bakers do Bakewell Tart… err… pudding | Mmm, Tasty! After missing last month’s lovely challenge of Strudel because we were moving, I knew I’d have to get this month’s challenge done. Wait, what? Is it a tart or a pudding? Well, here’s the thing: Traditionally in the UK, ‘pudding’ just means dessert. You know that line from the good ol’ Pink Floyd song Another Brick in the Wall: “If you don’t eat yer meat, you can’t have any pudding! How can you have any pudding if you don’t eat yer meat?” I do believe they meant dessert, not what we North Americans think of as pudding. Although maybe they meant a Bakewell Tart. Hmm, someone get Pink Floyd on the phone and ask them? Ahem, right, where was I? So the challenge was to bake a shortcrust pastry and top it with some jam or preserves and some frangipane. 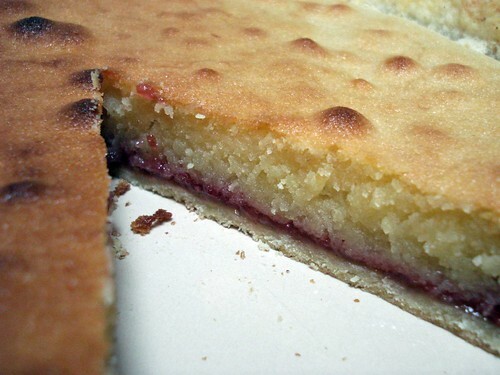 The shortcrust and frangipane needed to be from the recipes provided, the jam could be anything we wanted. I decided to make some simple ‘no cook’ sour cherry jam, using the recipe that came with my box of Certo. To be completely honest, making the jam was the most difficult part of this experience. The jam involved pitting (by hand! I only found a cherry pitter at my local kitchen supply place a week later….) and chopping all those cherries and then getting the quantities just right to make real jam. 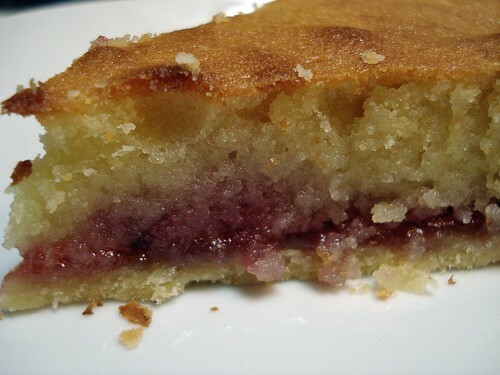 But the pastry was delicious and not difficult to whip up, and the frangipane was pretty simple as well. I think as long as you don’t have a fear of pie crust/shortbread dough, you can totally do this recipe. Rich and I enjoyed the tart but I’m not sure I’d make it again. We like almond well enough, but we don’t love it. That said, it was pretty addictive while we had it in the house. I kept sneaking little pieces here and there, since little slivers don’t have any calories, right? If you’d like to make this yourself, pop by Jasmine’s blog for the recipe. And I encourage you to take a look at some of the other versions of this tart by visiting some of the Daring Baker’s blogs!